This week there were two OMG moments in sports that we just had to tell you about. The first was Brazilian futbol star, Neymar and the other Pachulia Punching Iman Shumpert in the nuts. LatinoAthlete.com’s OMG moments for the week goes to soccer pro Neymar, who heated up Hollywood with his girlfriend Bruna. Neymar Jr. was on Jimmy Kimmel Live on Wednesday and while he was there Jimmy had him go to the roof in Hollywood to do some roof top soccer. The Brazilian athlete made a goal by kicking a ball from Kimmel’s roof to another roof across Hollywood Boulevard. Now before you say, noway over cars, Kimmel shut down the entire street for the stunt. Good thing they did that, because Neymar missed his goal the first couple times. It was weird to watch the 25-year-old standing on a patch of artificial turf on top of a building. You just have to watch this crazy roof top soccer moment. On Friday, during the Golden State Warriors vs The Cleveland Cavaliers game, Warriors center Zaza Pachulia took a swipe at Iman Shumpert‘s groin. 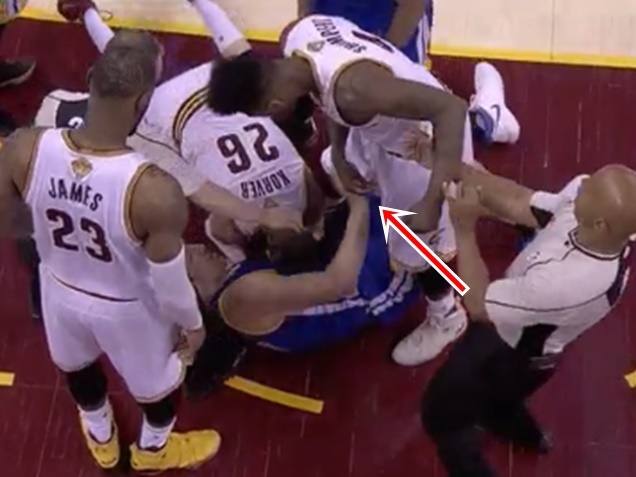 Pachulia and Shumpert got into a heated scuffle in the third quarter of Game 4 of the NBA Finals. The two NBA players were scuffling on the court for a a loose ball. That is when Pachulia took a jab at Shumpert nut who happened to be standing right over him. Iman was attempting to get the ball away from Zaza anyway possible. Unfortunately for Iman, Zaza wasn’t having it. This is the second time a Cavs player has complained about the Warriors going for their nuts. Earlier in the week JR Smith called out Draymond Green.